I really do like the way they did the Conference Program Guide this year. Rather than a hard binding like it's been in previous years, this year's is a three ring bound version in the portfolio provided upon registration. So when you get additional materials (such as the daily NewsWave) you simply include it in the three ring binder. The Pocket Guide actually came in the binder as well, you simply folded it up. I must admit it wasn't entirely obvious it was there though. Yes, there was an index tab that said "Pocket Guide", but it was fairly well down in the Program Guide so I didn't get to it until today. What I didn't particularly like was the map of the conference center (or rather, the lack thereof). 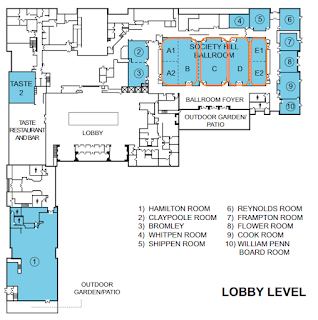 Only one floor of the four floors was actually mapped out. And the keynotes and lunches were held in the event center, which is a bit of a hike from the conference center. (Between the heat and the length of the walk, it kind of reminded me of previous conferences in DisneyWorld.) And there was no map provided in the conference materials for the entire hotel (so we could see how to get to the event center). There are maps scattered throughout the hotel as well as direction signs, but they're not always that helpful. They say that "all roads lead to Rome" but what I tended to find was that "all roads lead back to the casino". I lost track of the number of times I got lost in the maze of the first floor of the hotel in the first couple of days here. I have to complain about something somewhat related. The main reason I'm checking the Program Guide is to find where the sessions are. Perhaps the information wasn't available when I originally registered, but it certainly wasn't made available in the "add to Outlook" options that were you scheduled your sessions online. I took advantage of that option, and then synched with my SmartPhone so I would only need to carry that around. Ian's PocketBuilder app for tracking the sessions is great, but I really only wanted to handle it in Pocket Outlook. That's really an issue for the third-party that handles the registrations for Sybase. If they do decide to fix that for future conferences, they could also improve on the "add to Outlook" feature in another way. Once I had my schedule complete, I had to perform the "add to Outlook" operation individually for each session. There has to be some way to implement that in a batch process so that my entire schedule is added at once. Some kudos to the hotel though. Unlike the Gaylord Palms, the meeting rooms here are well marked. It was generally pretty easy to find my sessions, even without a decent map in the Program Guide. Also, as with the last two conferences in the Gaylord Palms, there is a WiFi hot spot in the conference center and high-speed connections in the hotel rooms. The email kiosks are back again this year as well. And, as opposed to the Gaylord Palms, there are plenty of other places to go within walking distance. You aren't trapped in the hotel if you don't have a car handy. On the other hand, the few times I usually come to Las Vegas is in winter, when the temperatures are reasonable. So although there are lots of places to go within walking distance, I'm not doing too much walking outside in Las Vegas in late August when it's 102 degrees.